If you explore the project management without prior experiences or doesn’t have enough time to check out all the points in this field, then you should firstly focus on the Work Breakdown Structure (WBS). You may be wondering “What does the WBS mean?” or “What are the key relationship between the traditional org chart and the work breakdown structure?” In today’s article, we will find out all the answers to these questions. Generally, the work breakdown structure is a foundational tool that helps managers to plan, organize, monitor and evaluate large projects. It usually starts with a big objective during the early stages of a project cycle, and then be broken down into smaller parts. The work breakdown structure normally focuses on deliverables (tasks, terminal elements and so on.) or measurable milestones. A traditional org chart generally focuses on the titles and duties of individual employees within a department or company. Both WBS and traditional organizational chart can reduce ambiguities in order to help users flesh out their responsibilities. The work breakdown structure is used mainly in project management field for multi-projects or a single program. Remote and internal project groups, technical groups, event planners, system engineers, residential and construction project managers use WBS for their projects. The organizational chart can be used to display the workforce structure for many fields including business, nonprofit org chart, and academic institutions. WBS usually includes the details of the project schedule, cost estimates, team member responsibilities, possible risks and so on. The org chart usually shows employee names, titles, employee photos, departments, working phone/email and more. 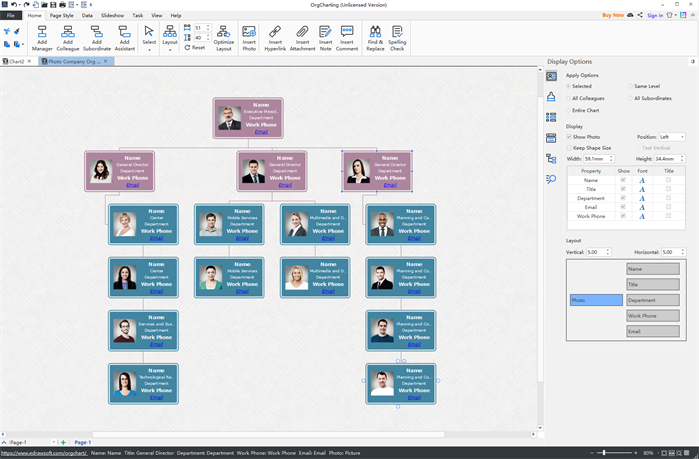 Both the work breakdown structure and traditional organizational chart are based on the hierarchical structure. In WBS, each parent level has a number of child levels while in the normal org chart, every department manager leaders several interns or staffs. However, if you look at the matrix org chart or flat org chart, things can be different. In this case, the clear hierarchy structure is gone and instead, a manager or boss may monitor a larger number of interns or basic staffs. Unless in the matrix or flat organizational chart, job duties are exclusive and independent both in WBS and traditional org chart. In a work breakdown structure, single shapes can be color-coded to represent different types of sub-deliverable status, for example, red for late, yellow for high risk, and green for success. This is an effective way to quickly check out key areas during the project process. In a traditional organizational chart, different departments or the overall company usually has a consistent visual style or theme. 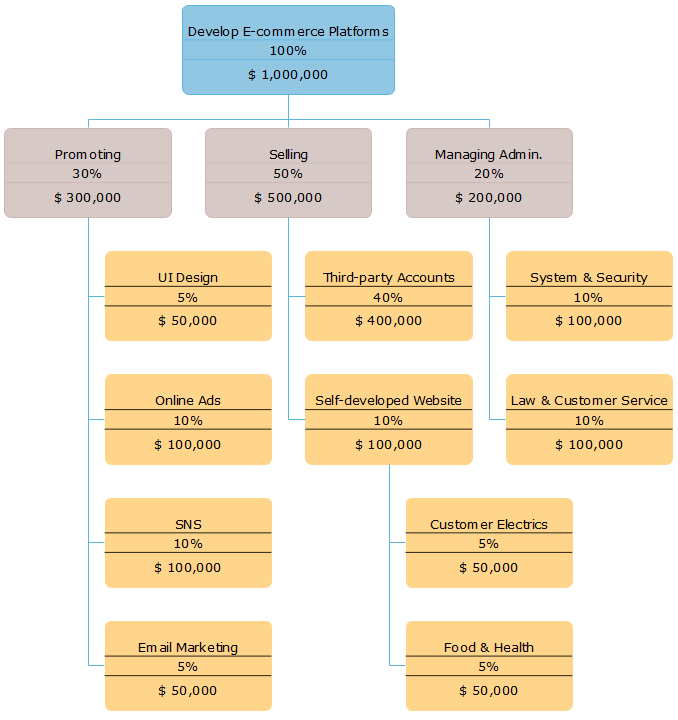 How to Create a Work Breakdown Structure? Now we have discussed all the key common points and differences between WBS and traditional organizational chart. If you wanna have a try to create your own WBS chart easily, simply use this easy org chart creator for your own work. By using this tool, you can quickly add new shapes and set your own project properties into the shapes.